This Sunday our Sunday Supper group is sharing Passover and Easter recipes. When I think of Easter in my home growing up we always had ham and scallop potatoes. In fact, my sister has kept the tradition going for many years, when the celebration is held in her home. I find myself experimenting with dishes and changing things up sometimes. This potato dish is different then the one I grew up with because the cheese is a different style and flavor and this changes the dish slightly. I like the use of gruyere cheese personally. The flavor is one that is unique and allows this dish to shine. I found this recipe a while back on a page called the French Tart. I will share my adapted version below. I even went and bought a fancy Le Crueset baking dish to prepare my gratin dish so that it would have the right presentation for my family. I love these oval baking dishes. I invite you to visit my friends from Sunday Supper (recipes below). 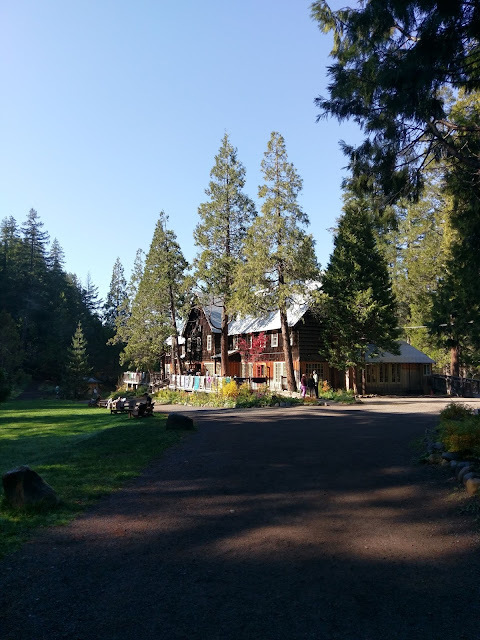 They are a great group of men and women and I am always impressed with their dishes and stories. Preheat oven to 3oo degrees. Butter the inside of a heavy duty baking dish. Add a layer of potatoes and a sprinkle of salt/pepper to the bottom of the dish, cover with cheese. Repeat this until all of the potatoes and cheese are gone. Your last layer should be cheese. In a small saucepan, add heavy cream, garlic and thyme. Bring to a gentle boil, remove from heat and remove thyme. Pour hot cream over potatoes. Bake for 1.5 hours or until potatoes are done and the top is browned. 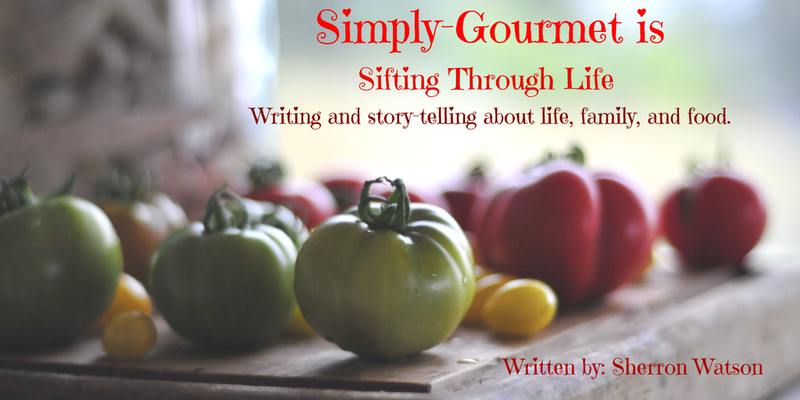 Join the #SundaySupper conversation on twitter! We tweet throughout the day and share recipes from all over the world. Our weekly chat starts at 7:00 pm EST. Follow the #SundaySupper hashtag, and remember to include it in your tweets to join in the chat. Check out our #SundaySupper Pinterest board for more delicious recipes and food photos. I grew up with this dish too, in fact my mother would make it every week at least once and mostly on Sundays. Mhm my mouth is water by looking at your pictures and the Gruyere, garlic and fresh thyme sound divine! Bravo! Your French Gratin Potatoes are gorgeous, Sherron. You've inspired me to finally buy a Le Crueset baking dish just so I can make your dish! 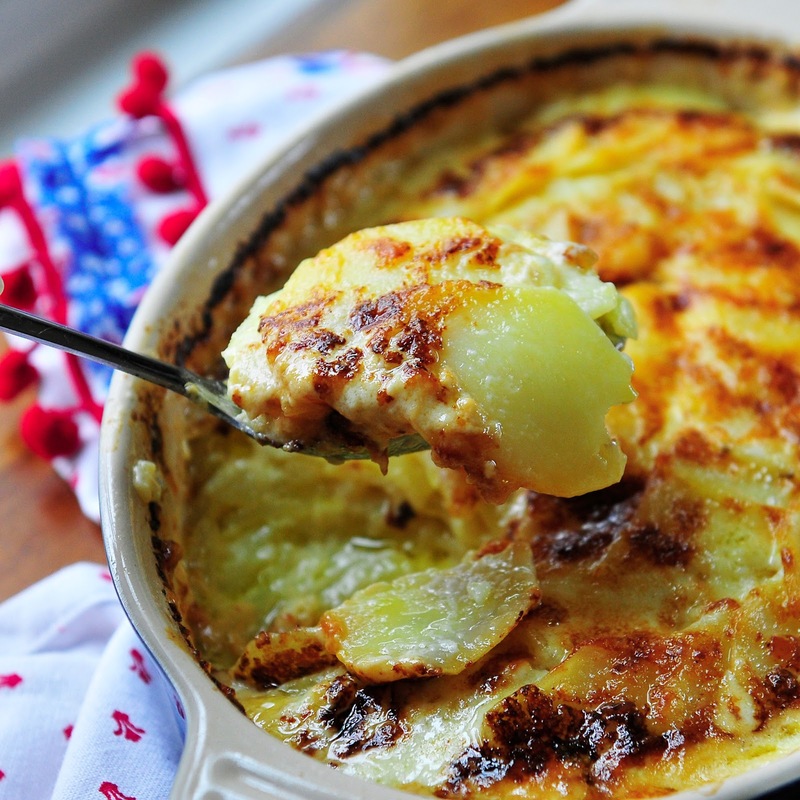 I've always enjoyed a good potato gratin and have yet to make the French version. You have inspired me and I get to use my pretty oval LeCreuset pan too. I haven't had potato gratin in forever! What a great and lovely dish!! This is a beautiful dish! I love the cheese and thyme. Great combo. Yum all the around. Thank you for sharing! I love potatoes! In any form. But add cheese and I'm certainto dig right in! I love potatoes made this way, thanks for sharing, Sherron! 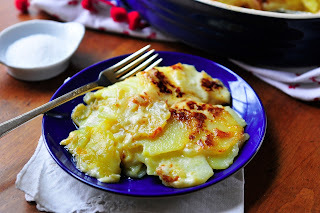 I haven´t made scalloped potatoes in years, but man, I love them! They will forever be a great dish, especially with gruyere! Wonderful pics Sherron. Oh, yeah...we'd LOVE to have this on our Easter table! And it would go perfect with the lamb I'm serving! Beautifully done! 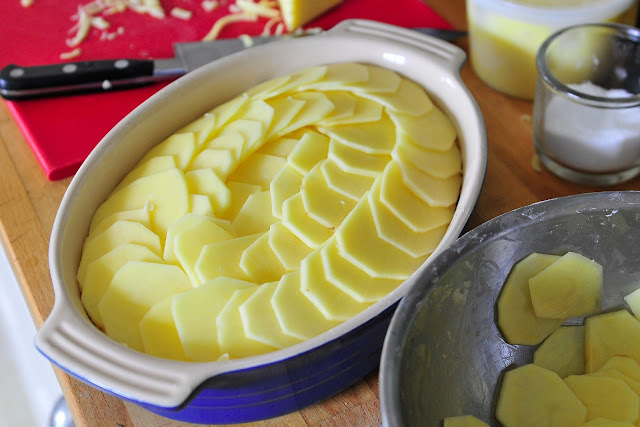 We're having these at Easter too, they're my stepbrother's new fave way to make potatoes! I LOVE Le Crueset (pretty dish! ), gruyere, and every single flavor in these... can't wait to make these! This looks AMAZING! I was just looking at the LC gratin dish yesterday--think I may need to add it to my kitchen! 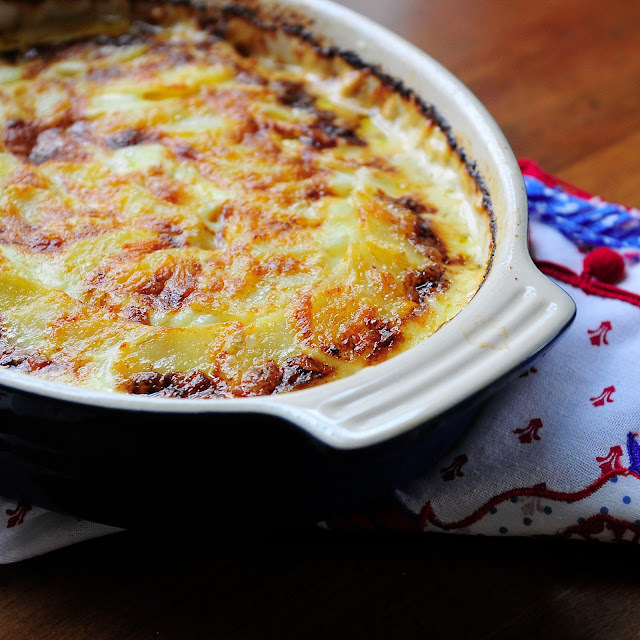 I love potatoes gratin and don't make it often enough. I think the use of the Gruyere Cheese sounds amazing. I just found the side dish I was looking for Easter Dinner! I'll take a gigantic scoop, please! These look wonderful. 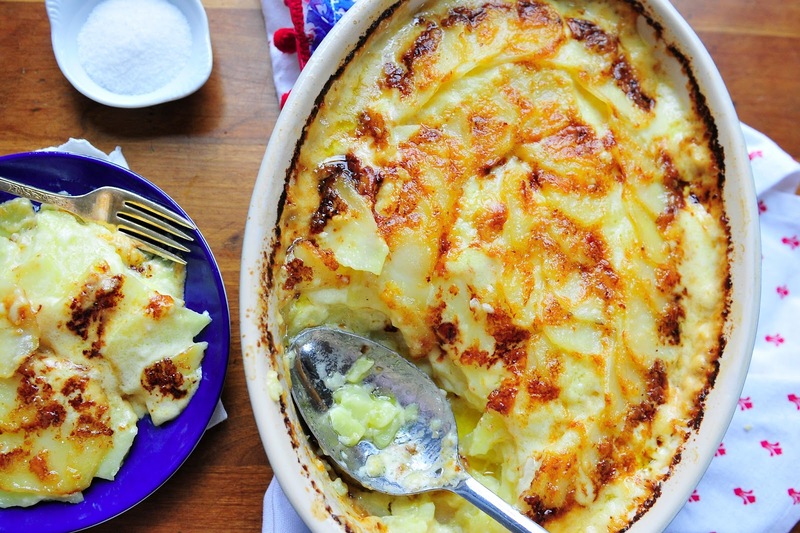 I love dauphinoise potatoes, and yours look wonderful - pass me a fork, please! We always have some form of potatoes for the holiday. Love this version with Gruyere cheese! Helllooooo cheesy delicious potatoes! I'd like a huge scoop of these, pretty please! I have always bought these in a box ( YUCK! I know!) I have always wanted to make this homeade and now I know! This looks amazing! Thank you so much for sharing! Happy Easter! Love the addition of Gruyere and thyme here. I bet this is delicious! Scalloped potatoes are, and have always been, my favorite thing about Easter! Yours look mouthwatering! Great recipe, thanks for sharing!